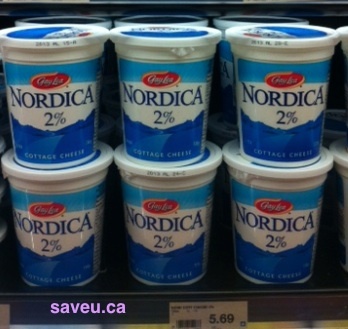 On Checkout 51’s list this week (April 4 – April 10, 2013) is Nordica Cottage Cheese, any variety of Nordica Cottage Cheese. You will get $1.00 cashback at Checkout 51. High in protein, rich in possibilities. Each serving of Nordica 2% cottage cheese contains 15g of protein. 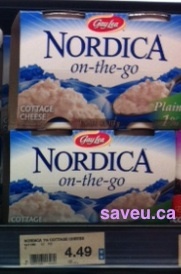 Anything goes with Nordica cottage cheese. From breakfast to lunch to dinner, Nordica cottage cheese goes with whatever you like and whenever you want it. Visit Nordica’s Facebook page for great recipes with cottage cheese. Here’s a pic of what it looks like. I found a couple prices of it at a few stores.